Ange and Macca have now finished in Hoy and South Walls. This map shows all the tracks they have walked in the last month. They haven’t confirmed any signs of stoats; however, Macca did find some suspect dead prey items. Also, there was another report of a stoat from South Walls a couple of weeks ago which is causing concern. Therefore, we plan to increase the number of traps on South Walls over the next few weeks in response. These traps will also act as a biosecurity trap network in the long term. A big thanks to all the landowners for welcoming Ange and Macca and providing shelter from the rain and much-needed cups of tea. Ange and Macca are now taking a bit of a rest and writing reports of their findings so far. They then want to do a few repeat visits to double check some areas. Ange has also been helping with a masterclass about how to determine whether stoats are male or female. It’s not as simple as some of you might think!!! Indeed, it can be quite tricky to work it out on immature stoats or if they’ve been dead a few days and it is important to know the gender of the stoats we are catching to help understand their behaviour. The third check of the trapping trial is underway. Wideford is complete, with two stoats caught. The first was a male caught in a double set trap in heathland using fish as bait. The second, a female, was also caught in a double set trap in heathland, but using beef as bait. Carmen and Rebecca are also nearly finished with Hobbister and are checking the traps in Grimbister today and tomorrow. While out at Waukmill Bay on Tuesday, Rebecca ended up rescuing a young guillemot. 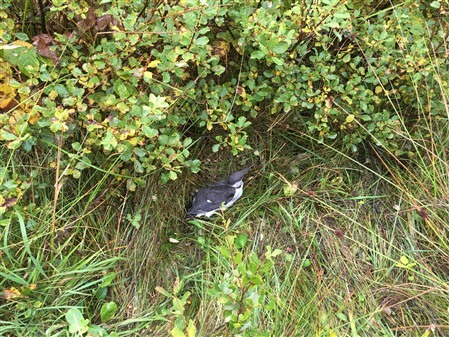 She’d just arrived in the car park when a man knocked on her window worried about a young guillemot hiding in dense vegetation just off the path down to the beach. She decided to help the bird out of the vegetation and, trying to avoid being nipped (a good sign the bird was feeling fairly OK) along the way, she laid it down at the water’s edge. Moments later it happily flapped away and dove straight in to the water, before resurfacing to preen. Good deed for the day completed, and glad the bird was in good enough condition that she didn’t need to call an animal welfare charity to rescue it, she continued with her day. In other news, Rebecca and Carmen were on a first aid course yesterday. We are also still looking to gather land access permissions to allow trapping and use of stoat detection dogs during the future planned eradication. So, if you own land in Orkney, even if it’s just your garden, and we haven’t spoken to you, please email us at ONWP.landaccess@gmail.com. The October check of the Biosecurity traps will start next week. Marina is also in touch with folk on Graemsay to get permissions to install a network of coastal biosecurity traps. Ange identified Graemsay as a key stepping stone island so we are taking her advice to prioritise getting biosecurity traps on to the island. Marina will be working with folk locally to hopefully get these in place over the coming weeks. We are also continuing to rearrange some of the traps to create the two lines of defence. Stromness and Orphir are already in this amended configuration, but we will continue to make tweaks to make this line of defence as robust as possible. 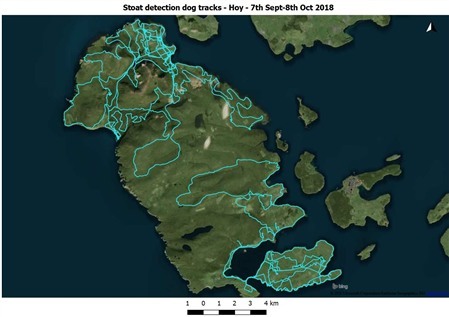 We are also working to get the locations of roadside traps input into the roads’ team’s systems of our partner Orkney Islands Council so that they know where they are when they come to cut the verges. 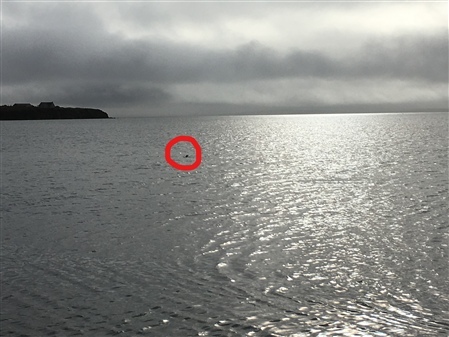 Shapinsay: Last Friday, Heather was on Shapinsay for the weekly check of traps and cameras. No stoats were caught in the traps and the camera footage is currently being examined by our growing team of volunteers. Heather will be back on Shapinsay tomorrow too. Hoy: Heather was in Hoy and South Walls yesterday, checking traps and cameras. She reports that it was a beautiful calm day, after a month of westerly winds, and that she saw several carder bees and a red admiral making it really feel like summer.